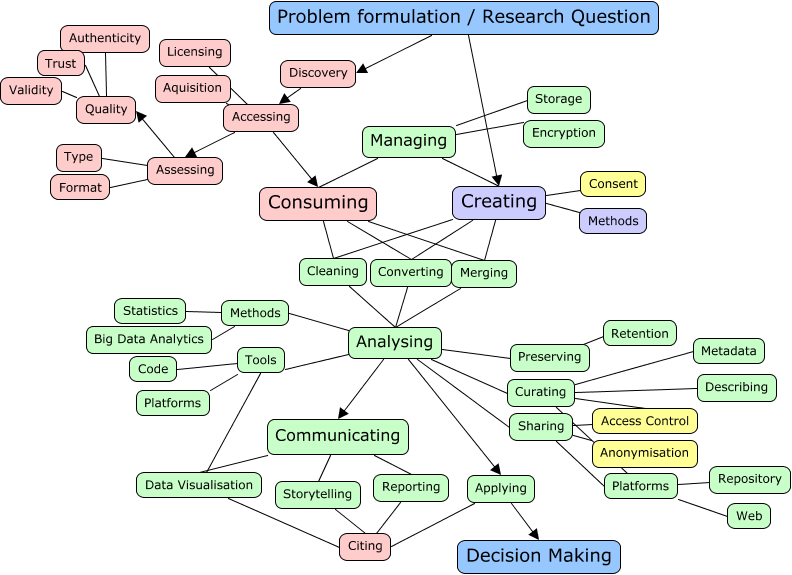 This post was inspired by a session around data literacy (DL) at Open data camp 3 and some follow up research and thinking on definitions and approaches to DL. Calzada Prado and Marzal (2013), adopted by Koltay (2015). But there are a range of alternative/overlapping conceptions and the concept is a dynamic, evolving one. Critical analysis and the ability to combine data from multiple sources are seen as crucial, as is an understanding of various dimensions of quality (including authenticity, reliability, acceptability, validity) (Koltay, 2015). Key areas where information specialists can help in the development of DL include: statistics, data visualisation, use of data in argument, citizen science, personal data management and data ethics (Fonticiaro and Oehrli, 2016). The following concept map draws together the main elements. I have coloured in aspects related to data consumption in pink, creation in mauve, those related to both aspects in green, ethical aspects in yellow. In the open data camp session, we discussed some core competencies within data literacy, namely: problem formulation, storytelling with data and an understanding of statistical concepts. It was noted that DL can be differently conceived depending whether you are focusing on data creators or data consumers. it was also proposed that DL skills can vary within a group, but as long as required specialisms exist within members, then it is able to tackle data problems. We were also introduced to OpenData Campfire, a collaborative platform for sharing open data analysis projects. I think that it is interesting and instructive to consider DL (and other literacies) from the point of view of the capability approach (CA) developed by Sen and Nussbaum in development economics. The CA was developed as partly a response to views of development as purely income- or utility- related and a recognition of the need to view human development more holistically and at the level of individual needs. Under the CA, a capability is the way in which individuals develop potentialities to participate and to get things done. This may result in a tangible “functioning” (achievement) or simply the capability or freedom to fulfil a function when desired. I like this distinction between function and capability, as the latter emphasises personal growth and the flexibility to apply knowledge to changing circumstances and priorities. Researchers in information ethics and ICT in development have proposed access to information as a central human capability and the CA as a useful theory to organise and evaluate action within community informatics, the participatory and bottom-up approach to information systems development within communities (Britz et al, 2012; Stillman & Denison, 2014). Britz et al (2012) view an information-related capability as needing to address personal, social and environmental characteristics, with these factors interweaving. So a CA conception of DL needs to include not only personal skills, but equalities of participation and an enabling environment for open data and its productive usage. The CA also stresses context-dependence and this can also help us to determine which DL compentencies are appropriate within a particular domain or stage in a data supply and usage chain. Stillman & Denison (2014) note the need for a communitarian view of capabilities in order to successfully apply it to communities. This chimes with the observation that the group / project team level might be the more appropriate (or at least an additional) unit of relevence for DL. So we can easily see how the CA can also be extended to data literacy - it is ultimately a measure of social justice the extent to which individuals and communities have the ability to access, interpret and analyse data that is of relevance to their concerns. Fonticiaro, K., & Oehrli, J. A. (2016). Why data literacy matters. ALA Knowldege Quest, 44(5), 20–28.